Scanner Mounting Fluid cuts down on diffraction of light allowing accurate sampling of film grain, evens the scanner's focal plane resulting in better focus, less time spent on post scan touchup and provides anti-newton benefits all at once. After being mounted on the scanner with Kami SMF 2001, when the film is removed from the scanner the SMF 2001 quickly dries clean. When removed from the scanner the film can often immediately be quickly wiped with a lint free scanner wipe and the film will be perfectly clean and ready to go right back into it's protective sleeve. SMF is extremely important for archival quality scanning and negative films. Many AZTEK customers exclusively use KAMI SMF for all of their film scanning. AZTEK mounting stations, scanner drums and flatbeds are all designed to be used with KAMI SMF. A petroleum based product with high anti-static properties. SMF Scanner Mounting non-carcinogenic however flammable. KAMI fluid has been put to test and is used by the most fastidious of scanner operators to capture the most from their film. The KAMI fluid acts as a medium in which allows the optimum path for light to pass through film and into your scanner's optics. The main issue with conventional dry scanning is scanning surfaces become detrimental in obstructing the light path during the scanning process. Light can stray not only between the film and scanning surface but diffract as light passes through the actual grain of the film. Unlike dry mounting Using the KAMI fluid will decrease the scattering effect of light as it passes through the film. 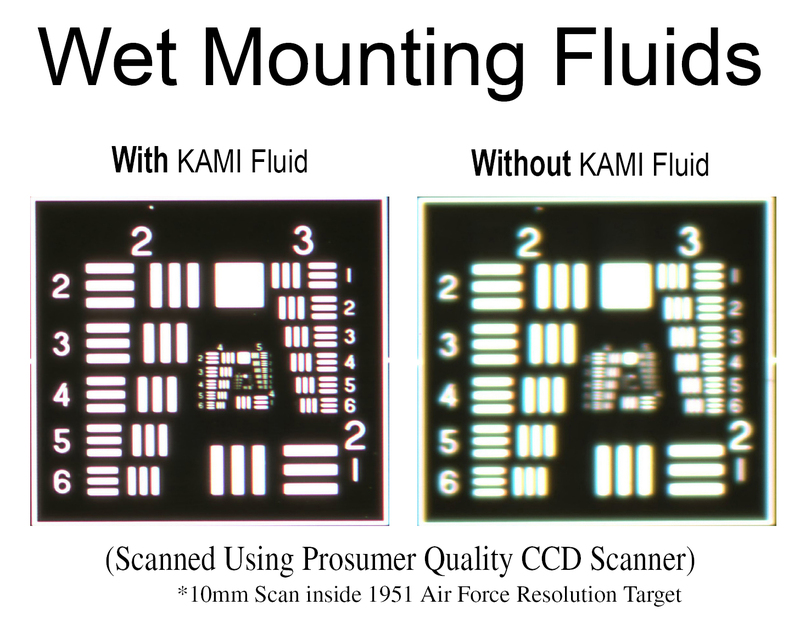 Hence giving you noticeably clean scans without the annoying blooming or newton rings typically seen in conventional dry scanning..
Another advantage to using KAMI fluid is that there will be less need for touch up as the KAMI fluid will fill in imperfections of the film surface. Saving you valuable time and money. Using this method of scanning will also yield an increase in the apparent focus/sharpness. This is achieved by the inherent physics and properties of the KAMI fluid's surface tension and cohesion between the film surface and scanner surface. Film is held evenly and flat across the scanning surface to allow a completely even focal plan for scanning. Click the button below to add the Kami (a) SMF2001 Scanner Mounting Fluid 4 liters to your wish list.